You might be seeing a lot more of Android Pay in the coming months. Google has deployed a new set of APIs for developers to build Pay into mobile web sites, instant apps, and even your email. The goal is to make the payment process faster and easier on mobile devices, but only in countries where Android Pay is accepted. Android Pay will be compatible with instant apps, the new partial app downloads shown off at I/O yesterday. That means you can get a rich app-based interface to place an order with Android Pay. Developers can use Pay to sell physical good now as well. See the B&H demo below. Websites are still where most people buy things, and not all of them will be connected to an instant app. So, Google has a set of web APIs to call up Android Pay, making the checkout process less awkward (see above). This "PaymentRequest" API is being developed with Chrome and will be standardized across browsers through the W3C. The last big improvement is with the Save to Android Pay API. That's what allows Android Pay to integrate loyalty cards, gift cards, and special offers into the app for quick access. The latest set of APIs lets developers create deep links that add those cards to Android Pay in a single tap. You might see them in emails, text messages, and even push notifications. 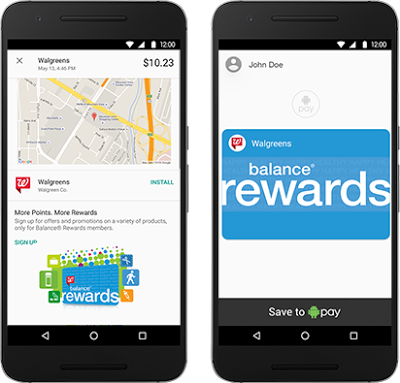 So, you might get an email about a loyalty program or deal with a handy button to instantly drop it into Android Pay. Developers who want to get started with the new APIs can head over to Google's landing page. There's also an intro to the PaymentRequest API from the W3C.